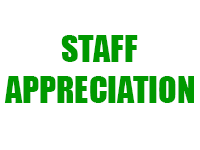 This month's staff appreciation lunch for both Central and Arroyo's staff will be on Friday, September 28. It will be held in the library so the teachers can have lunch and shop the book fair. If you would like to help, please bring items on the list to the Central library by 11:30 am Friday, or you can drop them at Marianne Jett's house - 1857 Elizabeth Street (@ Knoll) or Susan Raymond's house - 149 Kelton Avenue.